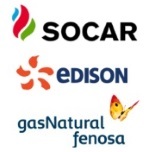 édité le 19/04/2018 - Plus de news de "Socar" - Voir la fiche entreprise de "Socar"
The Shah Deniz II gas sales contract with Spanish Gas Natural Fenosa was transferred to Italy's leading energy company Edison as part of a greater deal, including the acquisition of a gas grid in Italy. The signing took place at SOCAR Tower with the participation of SOCAR, Azerbaijan Gas Supply Company (AGSC), Edison and Gas Natural Fenosa. Edison acquired a 25-year gas supply contract from the Shah Deniz II field. The supply is scheduled to start in 2020, following the completion of the Trans Adriatic Pipeline (TAP). On the 13th of October 2017, Edison and Gas Natural Fenosa agreed to transfer the Gas Natural Vendita Italia (GNVI), an important gas grid in Italy. The transfer of Fenoza’s Shah Deniz II gas sales contract to Edison was subject to completion of this deal. In February, the European Commission has acknowledged the deal as being compatible with the antitrust regulation. Subsequently the acquisition of the GNVI and transfer of the gas supply contract were accomplished. This transfer demonstrated a constantly growing interest in Azerbaijani gas among major energy players in Europe. Edison is a major Italian energy company in the field of electricity and natural gas supply, headquartered in Milan, with subsidiaries operating across continents. Edison has an integrated presence in the hydrocarbons sector from production to distribution and sales of natural gas and crude oil. In 2017, Edison covered 22% of gas import and 6% of gas production in Italy. Shah Deniz Stage 2, the largest natural gas field in Azerbaijan, or Full Field Development (FFD) is a giant project that will add a further 16 billion cubic meters per year (bcma) of gas production to the approximately 9 bcma produced by Shah Deniz Stage 1. Edison is a leading player in Italy and Europe in the procurement, production and sale of electricity, in the provision of energy and environmental services thanks also to its subsidiary Fenice and in the E&P sector. Founded over 130 years ago, Edison has contributed to the electrification and development of Italy. It now operates in Italy, Europe and in the Mediterranean Basin, employing 5,000 people. In the power generation sector, Edison has plants with total capacity of 6.5 GW. Gas Natural Fenosa is a leading multinational group in the energy sector, and a pioneer in gas and electricity integration. Operating in over 30 countries, the company provides its services to almost 22 million customers on all five continents and manages a total installed capacity of 15.5 GW with a diverse portfolio of power generation technologies.